﻿Unlike Parts Suppose Josh made two trays of brownies for an upcoming party. He cut the tray of chocolate brownies into 12 pieces and cut the tray of butterscotch brownies into 6 pieces. Before his guests arrived, he ate one brownie from each tray. How many of each brownies did Josh eat? by splitting the original brownie into two parts as depicted in your workbook. Now we can solve our problem. Finding a common denominator means we must find a common multiple of the two denominators. We are trying to get equivalent fractions of the two original fractions that will have the same denominator, and since finding equivalent fractions involves multiplication, it follows that we must find multiples to get there. In general, we try to find the least common multiple of our two denominators so as to reduce the amount of simplifying we have to do later on. Finding the least common multiple can be done in a couple ways: one such way is listing all the multiples of the two denominators and stopping when you get a multiple that is the same in both lists. This is exemplified below. 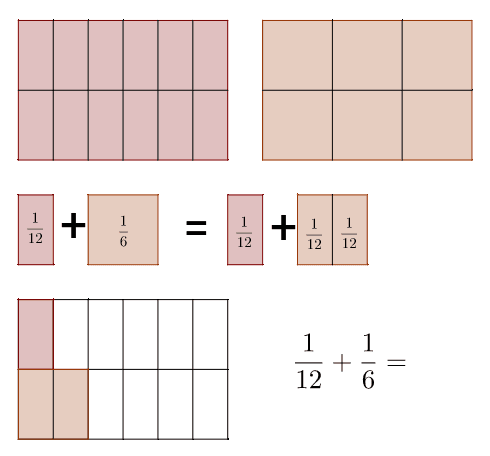 We then turn our two original fractions into equivalent fractions that have the least common multiple as the denominator. We can then add these equivalent fractions together because they have the same common denominator! Though this can be a wordy process, an applet with various examples is listed below. Add. Start by finding a common denominator. Write your answer as both an improper fraction and mixed number if possible. Subtract. Start by finding a common denominator. Write your answer as both an improper fraction and a mixed number if possible.